The Search for The Lost Dutchman’s Gold Mine is still our flagship team building game. We get testimonials like this one on its effectiveness every week. The Seven Seas Quest exercise was designed to followup on Dutchman but it is also an outstanding stand-alone exercise in its own right. 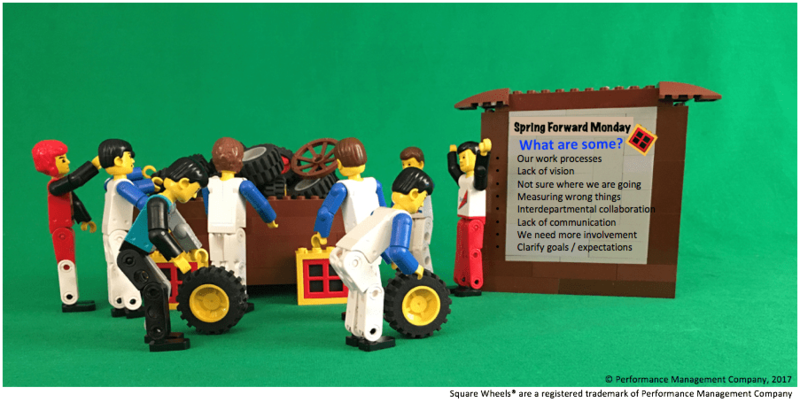 Innovate & Implement exercise anchors to our Square Wheels tools for involving and engaging people, as do our two Collaboration Journey exercises. Play of the games is pretty straightforward and the designs solid, based on a lot of feedback from users plus my own propensity to put a LOT of informational resources and detailed delivery materials with each game. I do not think anyone has ever complained about not enough information about presenting and debriefing. And, the reality is that ALL of my games are focused on simple and straightforward debriefing. The metaphors are always clean and easy to link to issues of organizational performance such as leadership or collaboration or planning. To help explain the different products, our website has a “Team Building Games Comparison Chart” that tries to outline the basic keys such as number of players, desired outcomes and applications, benefits and similar. We have games that work for 4 people and most games can scale up for hundreds. And we even show the actual price (it’s interesting that so few of our competitors will actually post the prices of their games; they seem to be almost embarrassed by the costs) as we feel we have the best cost to benefit ratio in the world for the kinds of products we design, sell and support. Plus, we sell all of our exercises “unemcumbered,” without the per-participant or annual licensing fees so common in the industry for full-blown simulations like ours. You can see the full Comparison Chart on the PMC website by clicking here – a version is added below but I am guessing that it will not be readable because of its size. We think the current products carry forward into a lot of different kinds of organizational development initiatives. If you have any questions or ideas, I am easily reached and I answer my own phone (which seems to surprise many callers but is the way it SHOULD be for such important decision making as product selection and team building). More fun is in store for all as I work up some new designs and I love it that we can design and offer these games that link so well to workplace issues at a low cost and as a great value. If you have any issues that you might like to see addressed with an interactive and engaging exercise, please drop me a note. My friend Brad wants to build a game on corporate sustainability for an executive development program he conducts at Furman University. And we have also played with the design of an emergency preparedness exercise. More and more, I am convinced that the key training people in organizations do not reside in HR / Training Departments but exist in the ranks of the line managers. The complexity of their job roles, however, can block their efforts to involve and engage their people to implement change and improvement. We need to look at that reality. Here are some thoughts and ideas. Managers are responsible for performance. Managers are responsible for quality and service. Managers are responsible for productivity and results. Managers do reports and attend meetings. And, more and more, we are driven away from the simple act of focusing on skills needed to motivate and retain people (including the managers!). Yet these same managers are the only ones who have the direct influence on the workers to understand issues and generate changes. So, what are we doing to provide managers with the tools they need to function as organizational performance improvement consultants, coaches for identifying best practices and communicating and implementing changes and improvements? Are we giving them the time they need and freeing up worker time for them to be asking, listening and considering? 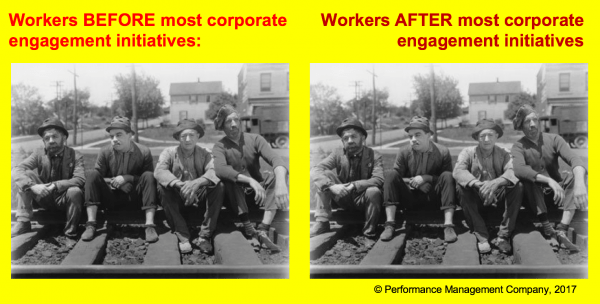 Are managers involving and engaging their people or are we just wasting time and energy thinking that they might? This could be brainstorming and an action to involve and engage people in workplace improvement. Or, this might represent another “Yell and Tell” training session. What do our managers need to do to shift the energy of these meetings and discussions from negative to positive? One solution is to use better tools and an approach that is facilitative rather than confrontational. This simply requires the right tools and some simple, self-taught facilitation training. Asking is a much better approach than Telling. Engaging is a much better approach than generating resistance to change. Generate SMILES, not frowns. For the past 20 years, I have been developing simple but powerful tools for involving and engaging people and generating ownership and performance improvement. And we need to allow the team and the managers the time to consider possibilities and plan actions. People have ideas for improvement and supervisors can do a better job of asking and engaging and implementing, don’t you think? Could people simply choose to do things better and more efficiently? Is ENGAGEMENT even possible, today? For all the statistics showing that employee engagement is really low and the surveys showing 2/3 of employees have the opportunity to improve their level of involvement, for all the studies about impacts for involving people from the motivational / ownership side of things to the impacts on innovation and creativity, I am thinking that believing that we can engage people in the workplace is simply wishful thinking. A reality in organizations is that we cannot expect things to change if we do not do anything differently and I think that the average supervisor or manager is simply UNABLE to get the time to stop pulling and sit down with people. We have a ton of anecdotal information capturing what supervisors actually do. This is far different from what supervisors “should” do theoretically. The reality in the workplace is that since 2008 supervisors have been charged with “supervising and doing task oriented staff work”. In other words, supervisors are now “working supervisors” doing tasks that staff would do except we don’t have a staff person or even a position on the books to place anyone. So supervisors are strapped to help complete the work of their unit and supervise, too. That matches with my perception of reality. They are trapped with too much to do. They are simply not given the opportunity to have alignment and idea meetings with their direct reports, since everyone is measured continually on their production and there is simply not the time. If you have seen any statistics on all this, please add a comment. The old Mintzberg kinds of research on time and motion do not begin to capture the realities of the modern workplace. And all sorts of different data point to the fact that “productivity” has had continuous massive jumps while the numbers of people who would like to quit their current jobs is very high, including managers as well as workers. 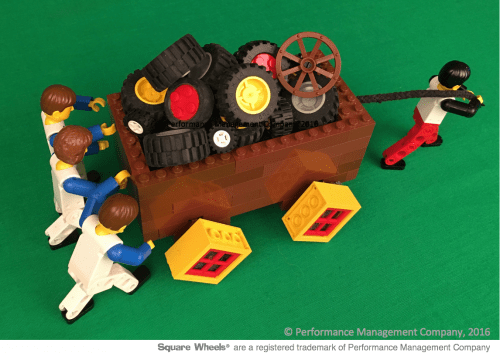 It would be most excellent if senior managers would understand that there is a lot of headroom for performance improvement if we can simply step back from the wagon a bit and look for and allow people to improve. before we become gaunt and dead? 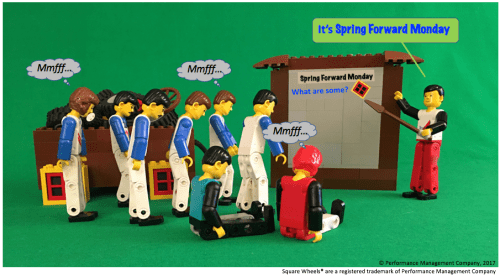 The round wheels are already in the wagon. We need to look at our supervisors and really understand if they have the time and resources to ask for and implement ideas for workplace performance improvement. There would be a LOT of positive impacts throughout the organization, for sure. My network of consultant users is sharing the idea that the “large team building event business” which has been pretty sparse is starting to pick up once again. There seems to be renewed interest by companies in hosting effective team building events for their management teams to help refocus on issues of business improvement or interdepartmental collaboration. The theme of strategy implementation has inherent interest, as does general teambuilding to improve interdepartmental collaboration. This is good for us because we offer one of the most effective simulations out there for helping to focus people in the theme of optimizing results through better communications, alignment and planning. We are also well-positioned to build on the successes of many of the outdoor training or challenge courses that set the stage for less work on individual learning and more work on organizational improvement. The Search for The Lost Dutchman’s Gold Mine fits a unique position in the marketplace. It is inexpensive to own and use, with only a one-time purchase price and no annual fees or licensing requirements or similar. A corporation like Wipro can run it with 30,000+ employees with the additional cost of printing paper, for example (true!). And I just got a testimonial from a consultant user who has had the game in continuous use for 19 years (that even shocked me!). And people are reporting that their organizations have not been doing much with teamwork, sometimes for many years. They battened down the hatches on those kinds of developmental events a few years ago and just have not moved toward re-energizing their people or refocusing or realignment. The time seems to be approaching when some solid OD will have clear benefits. If you might be interested in a solid developmental activity, you can rent the exercise from us, custom-packaged to meet your desired outcomes. You are dealing with the principle designer and owner of the company, so you get hands-on support at a high level. Lots of people look to do team building within their organizations and Dutchman is one of those exercises that works well with small and large groups. Normally, my conversations are generally with consultants and trainers who have been doing these kinds of things on a smaller scale and are looking for some new tools and approaches. Many of those conversations were with the, “been there and done that” crowd who were simply looking for some new and better tools than what has been out there in the marketplace. We also just put together an agreement with Challenge Korea, an outdoor-based team building company who is going to begin using Dutchman, in Korean, and working to assist the larger companies there. It will be a good product addition to their current offerings, and will enable them to build more collaboration and followup implementation with their clients. So, it has been fun to put my Coaching Hat on once again, along with my Event Planner Hat, and offer up some ideas for optimizing impacts for these new clients.We just had one organization run Dutchman with 9 different groups of college accounting students all over the US, with sizes from 140 up to 250 — and with great reported successes. The exercise is about getting help along with information and on collaborating and sharing information and resources to optimize results. But what leaders see are people choosing NOT to get available planning information, to compete rather than collaborate among tabletops and to choose to not get help from the game leaders who are there to help! The messages are pretty obvious and the debriefings are most excellent. Anyway, it is really neat to see these kinds of large events start happening again, since they can be powerful events to engage people in change and improvement and to lead them out of the current “engagement doldrums” that we seem to find ourselves. Have some FUN out there yourself! Here is what I think is the best closing storyline out there, after attending a whole big bunch of sessions for training and development or team building programs. This is the narrated version, with my comments about delivery and anchoring the joke / story to the session’s desired outcomes or key learning points. Any comments and suggestions and reactions would be most appreciated, for sure! What we suggest is that the presenter show the illustration and then allow people to play on a worksheet that asks them for their ideas on how the illustration might represent how things work in most organizations. We use “most” to keep it arms-length, but many people will use the drawing as an inkblot test and project their ideas about it onto the worksheet. We allow individuals about a minute of “silent refection” prior to working and sharing their ideas with others at a table for 5 to 6 people. It all seems really simple. But using it over the years, I will admit to being shocked and amazed at how well this works as a projective instrument to help diagnose organizational issues. The very nature of the group interaction also lets other people frame and reframe ideas until the collective work is nothing short of amazing. 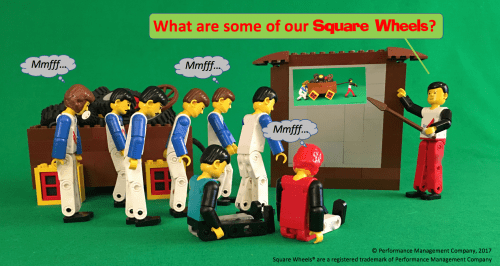 What we generally suggest is to allow the tabletops to select on relevant Square Wheel and then work on generating 3 round wheel potential solutions for consideration, with the idea that we will force some additional considered alternatives rather than the first thing that comes to mind. Those ideas can then serve as the basis for a strategy for implementation. The above bullets represent less than 2 of the 8 pages of thoughts and ideas that I have captured while showing the illustration. You can see from the above that there is a great diversity in viewpoint over something as simple as a line drawing. When you consider the complexity of the actual workplace, there are no simple views that are most correct. • Those who do have no clue, and those who lead can miss the need. • We’re not like that! 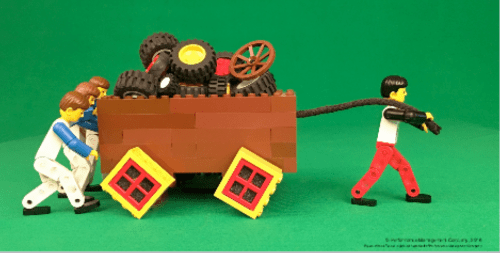 We push our wagon uphill! • You should have seen what we did Last Year! – but the men are stupid enough to push it that way! Our perceptions can be extremely limited, especially when one considers John Le Carre’s quote about a desk being a dangerous place from which to view the world. What we really need to do is actively work to involve and engage people in discussions about what things in the workplace need improvement. That engagement works wonders when some of those ideas can be implemented, as they usually can. I have written extensively on the statistics and benefits of improving the active involvement of people. My blog is full of different articles around un-engaged and unmotivated people and ideas for making improvements. There are even articles on the issues and realities of sabotage that the actively dis-engaged people may take. 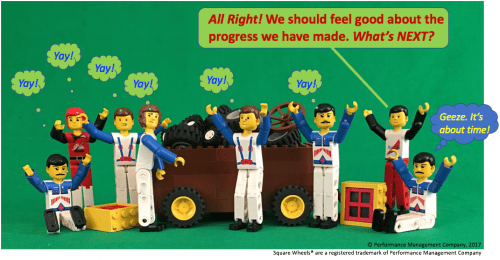 If you would like to read more about the Square Wheels tools for actively involving people and facilitating workplace improvement, click on the link below.